HAWS, the Humane Animal Welfare Society of Waukesha County, has been awarded a $5000 grant from Animal Fairy Charities, Inc. to further the life-saving work conducted by HAWS’ Behavior Department. Mod Squad dogs fall into several categories, including those that don’t thrive in shelter environment or have been in residence at HAWS overly long. Training efforts are focused largely on shelter dogs that have passed the behavior evaluation process but are not quite ready for adoption, those dogs that have not yet passed the evaluation but might do so with further work and those dogs up for adoption that are in need of basic manners training to ease the transition into their new forever homes. All the positive training methods involve use of socialization and enrichment techniques. Since the creation of HAWS’ Behavior Department in 2009, more than 2000 dogs had been aided through the Mod Squad, private behavior consultations and public training classes. Founded in 2007, Animal Fairy Charities is an all-volunteer 501(c)3 based animal welfare non-profit organization, that distributes funds in support of the missions of other animal non-profit organizations using a federated (i.e. United Way) method. In addition, Animal Fairy Charities educates and engages young children in compassion through the positive interaction with animals. HAWS, a non-profit organization established in 1965, assists over 6,000 animals each year and welcomes more than 31,000 human visitors to our shelter annually. As an open admissions and full service shelter, HAWS assures sanctuary for animals in need while offering educational programs and a myriad of services to promote responsible pet ownership and prevent animal abuse. The shelter is located at 701 Northview Road in Waukesha, Wisconsin. For more information call (262) 542-8851 or log onto our website at http://www.hawspets.org/. 1. Animal Cancer is naturally obtained or spontaneously developed, as opposed to experimentally induced, as is the case with lab mice. 2. In many cases, pets develop the same types of cancers as their human care-givers do. 3. Animal tumors are similar to human tumors in terms of size and cell kinetics. Dogs and cats also possess similar physiology and metabolism characteristics to humans, which enables us to compare treatments such as surgery, radiation and chemotherapy. 4. Most pets are large enough for high resolution imaging studies, as well as surgical intervention. 5. Dogs and cats have intact immune systems as opposed to many rodent model systems, enabling immunologic treatment approaches to be explored. 6. Most animal cancers progress at a faster rate their human counterparts, permitting more rapid outcome determinations, such as time to metastasis, local recurrence and survival. 7. Animal trials are more economical to perform than human trials. 8. Because fewer “gold standard” treatments exist in veterinary medicine, it is ethically acceptable to attempt new forms of therapy – rather than to wait until all “known” treatments have failed. 9. Dogs and cats live long enough to determine the potential late effects of treatment. 10. And the recent elucidation of the cancer genome and its resemblance to the human genome provides unparalleled opportunities to study comparative oncology from a genetic perspective. The inclusion of veterinary species in clinical trials plays a key role in advancing the diagnosis, treatment and prevention of cancer for all species. The pharmaceutical industry is starting to invest more in animal cancer research. But in order to accelerate the adoption of clinical trials, we need pets – in large numbers – to participate. The National Veterinary Cancer Registry wants to identify these pets and make them available to participate in trials as they emerge around the country. Please help us spread the word to veterinarians, pet owners – and all of your readers – to ask them to register their pets that have been diagnosed with cancer. The registry is available on NVCR’s website, by clicking here. Sarasota veterinarians warn pet owners every summer to take proactive steps to keep their pets cool, and avoid heat illnesses, such as heat stroke. The Bee Ridge veterinary clinic remarks that while they see several cases of snake bites, and accidental foreign object ingestion, most of the cases they seem to constantly see each summer involve pets suffering from heat stroke. Sarasota veterinarians say there are simple steps to follow to help keep your pet from overheating this summer. The veterinary clinic encourages pet owners to monitor their pet’s water consumption. Ronni Tudin, who leads the Bee Ridge veterinary Clinic staff along with Dr. Robin Sego, explains, “Keeping track of your pet’s water can be a very strong preventive measure against heatstroke, and is a vital part of proper summer pet care.” Water that is cool and fresh will allow your pet to maintain proper hydration levels and is one way to help them deal with the hot summer weather. The Veterinarians also warn that pet owners be cautious about the temperature of the water. If your dog or cat has a metal water bowl, make sure to keep it out of the direct sunlight, since the metal can easily heat the water up. Bee Ridge Veterinary Clinic recommends adding small amounts of ice cubes to the water periodically to allow for gradual and constant water cooling. Sarasota veterinarians at Bee Ridge recommend that pets should stay inside the cool house with these scorching summer temperatures. If for some reason the pet must be outdoors the clinic says it is imperative that there be a shelter that offers the pet shade, and be placed out of the direct sunlight, if possible. While the temperature will still be very high during the summer heat, being out of direct sunlight can do a great deal to prevent heat stroke. When walking your pet, go during the early morning or late afternoon, when the weather has cooled down a bit. Sarasota pet owners are reminded to never leave their pet in their car in the summer heat, no matter how long they are gone for. Pet owners are advised to seek immediate veterinary medical attention if they believe their pets are suffering from heat stroke. Signs of heat stroke include excessive panting, stupor, possible seizures, dark red tongue and gums, uncoordinated, and rapid or irregular heartbeat. Dr. Tudin says, “Pet owners can try to cool down pets by placing cool, damp towels on their body and paw pads.” Although, Dr. Tudin warns pet owners to never try to cool their pets down with cold water or ice packs as this can worsen symptoms. The Bee Ridge Veterinary Clinic is located in Sarasota, Florida. The veterinary staff services include basic and advanced pet care, and the clinic features an on-site pharmacy. For more information on heat stroke and other heat related illnesses please visit the clinic’s website at http://beeridgevet.com/. Deploying in pairs, military working dogs and their handlers share a bond exclusive to their career field – each directly dependent upon each other to accomplish the mission. This bond is strengthened in a deployed environment keeping the 380th Expeditionary Security Forces Squadron military working dog teams focused on improving their capability. A capability that provides an extra level of protection for the members of the 380th Air Expeditionary Wing and every person visiting the installation. Military working dogs can be trained to smell anything from money to narcotics, to recognize hostile actions and to act appropriately in these situations. Intense heat, long days and new surroundings test these abilities unlike back at home station, said Serrano. Every morning, handlers arrive an hour before their shift to perform health and welfare checks on their dogs, they warm up together with a stretch and jog, and hit the road for patrol. 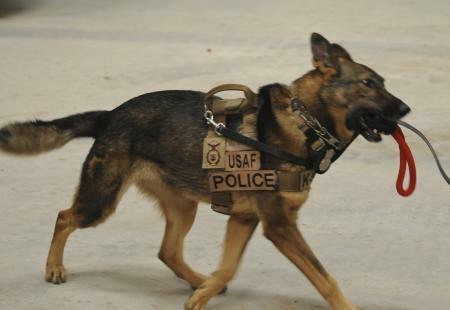 Military working dogs and their handlers patrol for several purposes, said U.S. Air Force Staff Sgt. Bruce L. Martinez Jr., 380th ESFS kennel master. They provide real and psychological deterrents for any person who might have malicious intentions. Throughout the day, the teams could be faced with several different types of missions under a wide-array of conditions. From working at a vehicle search area to providing security for visiting dignitaries or the U.S. Navy, military working dog teams are always on the move. The needs of the military working dogs are not always easily met: they must be trained, fed, provided medical care and monitored by their handlers. Growth and progression mainly come through training. During the day, when military working dog teams are not needed elsewhere, they train. From bite drills, to testing the dog’s senses for explosives or narcotics, the 380th ESFS handlers keep their dogs busy. By the end of the day, handlers and military working dogs are typically exhausted. However, having each other makes everything a little bit better, said Serrano. The reward is shared for a long time, as handlers and their military working dogs will travel back to their home stations together and continue their relationship. KHAWS teaches children about animal safety and pet care responsibilities, while interacting with the shelter’s animals. The “membership” into this club is only $40 per child and includes a free stuffed animal! Meetings are held one Friday night each month during the school year. Each month we will feature a guest speaker sharing their expertise on an animal-related topic, after which we will participate in several activities around the shelter such as socializing animals and making pet toys and treats! A club for animal loving kids in middle school through freshman year in high school! For many years, we’ve been asked about volunteer opportunities for children. Currently, our volunteer opportunities require that children ages 13-15 partner with a parent, both in volunteer training and while volunteering here at HAWS. Critter Club is a unique volunteer and educational opportunity, which provides opportunities for kids in the 6th through 8th grades to volunteer at HAWS on Saturday or Sunday mornings from 9am to 11am without a parent, and attend educational programs on Thursdays at HAWS between 6pm and 7:30pm. A Critter Club session will run for an entire school semester, and costs $150.00 per session to cover our staffing costs, as well as other expenses. Critter Club members must apply for membership, submit recommendations from two non-related adults (teachers, ministers, scout leaders, etc.) and write an essay about why pets are important. Once these submissions are reviewed, we will invite the best candidates to join the program within two weeks of the first-scheduled meeting. To find out meeting and volunteer dates and obtain more information on applying for membership click here! HAWS Animal Career Exploration is a club for high school aged kids interested in pursuing a career in animals! “Veterinarian” is usually the first thing that pops into someone’s head when thinking about jobs with animals. But how much do you really know about becoming vet, and did you know there are TONS of other animal related careers? Are you creative? Maybe you’d enjoy a job as a groomer. Good problem solver? Perhaps you could become a great dog trainer. Interested in law enforcement? What about a job as a Humane Officer? HAWS Animal Career Exploration (HAWS ACE) is a program for teens in 10th – 12th grade to learn about the variety of careers available in animal care. Members will get a chance to hear from speakers working in different animal-related jobs, learn more about HAWS and our mission, and get some hands on experience working with animals. So how realistic are the things you’ve seen on TV about Veterinarians and Humane Officers? What does it actually take to work those jobs and others? What kind of training do you need? Join HAWS ACE and find out! Cost is $40 for the semester and meetings are held on one Wednesday a month. Since Operation Enduring Freedom in Afghanistan began back in 2001, thousands of troops have been deployed overseas. While amidst the chaos and wreckage of war, some soldiers have found friends in the form of stray dogs. Recently, a compelling story was brought to the attention of Guardians of Rescue, who is now doing everything possible to transport “Sheba” and her pups to the United States on September 4th, 2013. While deployed in Afghanistan, a team of soldiers came across a stray dog. Before long, the team had adopted the dog, naming it “Sheba,” who came to protect the soldiers from other wild dogs in the area. After Sheba gave birth to seven puppies in March, the team donated their limited free time to feeding and caring for the puppies. The soldiers reached out to Guardians of Rescue with a plea to transport Sheba and her puppies safely to the United States. Guardians of Rescue is on call 24/7 and a volunteer-based organization that relies completely on donations. In mid-June, Guardians of Rescue implemented a mission that transported Sheba and her family to a safe shelter in Nowzad, Kabul. Sheba and her puppies’ journey from Nowzad to the United States will cost $4,000 for each dog and Guardians of Rescue is reaching out to everyone for donations to help spare the lives of this mother and her family. Guardians of Rescue is a non-profit organization aimed at Animals Helping People and People Helping Animals. They provide food, veterinary care, and shelter to animals in need. They provide instrumental education to young people about animal abuse and how to prevent it. Guardians of Rescue founded programs such as Paws of War to help active military and veterans with the use of therapy dogs to assist with post-traumatic stress disorder. To learn more or donate, visit http://www.guardiansofrescue.org. Based in New York, Guardians of Rescue is an organization whose mission is to protect the well being of all animals. They provide aid to animals in distress, including facilitating foster programs, rehabilitation, assisting other rescue groups, and providing support to families, both military and not, who need assistance due to economic factors. To learn more about Guardians of Rescue, visit the site at http://guardiansofrescue.org/. In these pictures, Cosmo is enjoying a spa day at HAWS with our Kids ‘N Critters campers. As you can see, he’s doing great with them – he does great with most people and has made friends with others of the dog persuasion, but he isn’t a cat fan. Cosmo has been at HAWS much too long – and, like all of us, he’s not getting any younger. At 9-years-young he’s a staff favorite with his calm, mellow temperament and the goofy way he likes to lounge on his dog bed on his back. He’s a neat combo of Pitbull, Dalmatian …and lazy bum! Cosmo enjoyed getting wet on his spa day (it was a hot one! ), but he loved even more getting toweled off by the kids! Really, who doesn’t love a good back rub? We’ve got video of Cosmo in action – in case you’d like a preview before you come to meet him at our shelter. But please come to see him in person. He’s so worth it! Learn all about HAWS’ adoptable friends here. Or, better yet, stop by in person – HAWS is open 7 days a week.